This isn't supposed to be a proper program - it's supposed to demonstrate the bare minimum you need to replicate the functionality of HTML Help Workshop's hhc.exe. 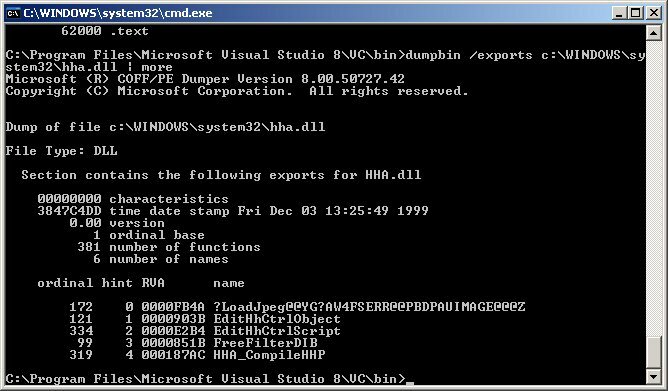 hhc.exe is great for generating CHM (which no-one speaks) files from HTML (which everyone speaks). However, if you want to use it dynamically (i.e. not provide CHMs with your binaries), it's a bit confusing. HHW's license specifies you should only include the redistributable. This rather useful resource page from the Helpware Group gives two really interesting bits of information. From win2k onwards, HHA.DLL comes with your windows installation.Alas, not quite correct, I probably misinterpreted the helpware page... :( . You can get HHA easily, but it doesn't seem to come with vanilla windows. More anon. The two callbacks you have to provide are used to provide running status information (for status bars etc), and to provide useful output. And... that's pretty much it. 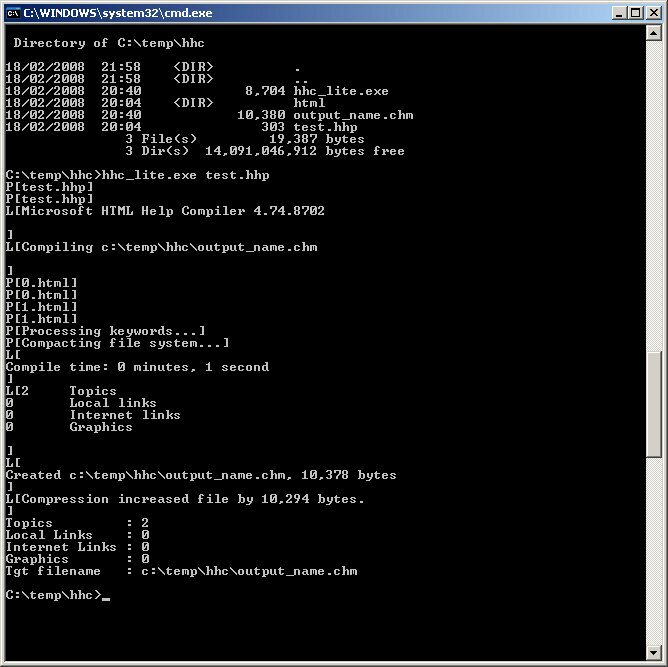 There's some useful output that comes back from the callbacks, and the below program, entertainingly, pretty much performs the same functionality as HHC.EXE. And you don't need to either call out, or install HTML HELP Workshop - just aggregate this functionality! sample help source to test against.